There are 5 posts in this thread, and it has been viewed 9438 times. 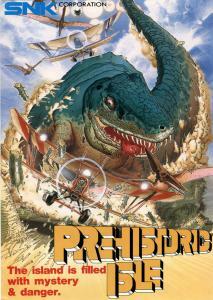 Prehistoric Isle: Something good to come back to? Sorry for the delay, but Game of the Week is finally updated! Instead, come join the discussion thread! This old shooter is pretty original in many ways. I like the way the cannon changes its different powers when it rotates around the biplane. The control system would have been perfect if the C button were used to rotate the cannon anti-clockwise in addition to the B button used to rotate the cannon clockwise. The title Prehistoric Isle should be taken literally, because this is not Jurassic Park. The existence of creatures from the Cambrian, Silurian and Quarternary Periods certain makes the game interesting. It shouldn't surprise you that all creatures, even the Herbivores are dangerous and hostile. 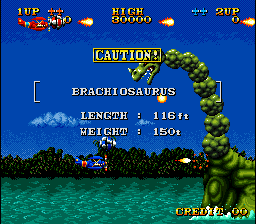 However the boss dinosaurs are grossly out of scale especially the final boss, the Tyrannosaurus Rex larger than the actual largest dinosaur, the Brachiosaurus. Possibly that was to give the impression that the T-Rex was more dangerous and deadly than anything that ever walked the isle. With abilities to spew and looch fire and flames, you'd probably called those dinosaurs, dragons. The idea of an Unknown Dinosaur was kinda stupid. They should have used a giant Triceratops, an Ankylosaurus, a Parasaurolophus or even better a Velociraptor. The sceneries of the scenes are not very rich in colour and detail especially Airborne and the Underground. The music is okay, but some like the second and third stage are lacking in mood and rhythm. I was not amused that rows of balls were used for to animate the Brachiosaur's neck and the Rhamphorhynchus' tail. Funny that they chose the Bermuda Triangle and there you have a theory on the mysterious disappearances. Because of Prehistoric activity and prescence nobody is safe within the triangle. I would say that Prehistoric Isle is brilliant fun to begin with, but it will wear out for a player shortly. Hi, I updated main post with a link to the Higscore Challenge. I like this game its a typical quirky 80s SNK release that did not seem to receive much attention when it appeared in the local arcade where I live 89/90 ish. The exploding red gibblets of dinosaurs are actually pretty gross, just shows you could get away with a lot in the 80s. I agree its a fun and colourful shooter that shows SNK were starting to improve just before the NG. I also like the sequel on the NG shame its MVS only and hard to find. Wow I think this has been one of the least discussed GOTWs so far with only two people giving an opinion about it. I've been playing this one a lot recently and so far I'd say this is probably my favourite pre-Neo Geo game by SNK. 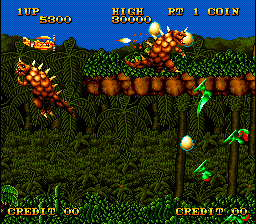 A really enjoyable shoot 'em up with appealing colourful graphics and I like the prehistoric theme with loads of types of dinosaurs both on ground and in the air and little cavemen running around. 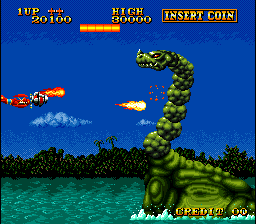 There are some impressive looking bosses too especially the last one a Tyrannosaurus Rex. One neat thing is the option item or pod you can get and also power up. Having the option item in different positions gives very different types of attack and it's fun experimenting and working out which is the best firing position for different parts of a stage. Only slight negative I can say is that if you make a slight mistake and get hit you lose all your weapon and speed power ups and are very vulnerable. It's easy to lose the rest of your lives shortly after that which can be a bit frustrating. Anyway overall this game is highly recommend to shoot 'em up fans!